The Powerbuilt 620479E Xtra Low Profile 2 Ton Floor Jack is a rather unique looking jack that recently piqued our interest. As such, we decided to do a review! Overall, its different architecture and extremely low profile make it a great jack for lowered cars, modified cars, and cars that see a lot of track time. 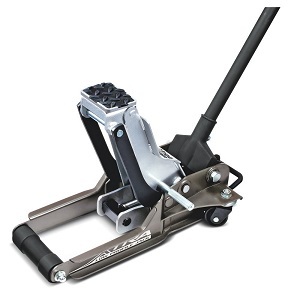 When it comes to build quality, we found Powerbuilt’s floor jack to be quite nice. The finish is outstanding when it comes to scratch resistance and general overall feel and look. The jack is finished in a rather striking gray and black with stainless hardware, which is most certainly pleasing to the eye. Don’t be fooled though, because this jack isn’t all looks. It also is structurally very well built. The fit is generally good with no visible tooling marks and overall alignment is good. The jack doesn’t have much slop and everything feels just a little bit overbuilt (which is a good thing if you are relying on a jack to support the weight of your car). Overall, it is undoubtedly a high quality jack. As far as features go, this jack is loaded! First, the minimum height is a cool 2.75″, which is low enough to slide underneath most lowered cars or track cars. The maximum height of the jack is 15-1/2″, which is pretty respectable as well. The saddle is square shaped and topped with a rubber pad. The square shape saddle is a departure from the typical round saddles found on most other floor jacks, but we found it to be just as easy to position. Another really interesting feature is the included safety bar, which slides under the lifting arm in order to provide a mechanical stop that prevents it from retracting. Powerbuilt asserts that this can replace a jack stand under certain circumstances (we suggest reading the instruction manual before attempting to use this feature to make sure you fully understand it as there are potential safety concerns if you do not use it correctly). The jack supports a capacity of 2 tons, which should be plenty to get everything from something as light as a Toyota Corolla to as heavy as an Audi A8 up in the air. As far as mobility, the jack has two swivel casters in the rear and a single wide fixed wheel up front. Positioning the jack is easy, especially if you use the rear facing handle. We like the rear facing handle because it allows for easy position when the jack is deeper under the car, unlike most jacks that have the handle on the side. When it comes to value, we rate this jack as being pretty good. If you have a few more bucks lying around we still prefer the Arcan XL20 by a slight margin, but nonetheless this jack will still treat you well as it is pretty affordable. Overall, we would recommend this jack! As far as where to buy, we typically recommend Amazon as they have an extremely attractive price shipped which seems to be more attractive than elsewhere online (remember, floor jacks cost quite a bit to ship due to their weight from many retailers). That said, there are tons of different jack options available on the market, so if this jack doesn’t suit your needs perfectly, feel free to take a look at our floor jack buyer’s guide for more suggestions.